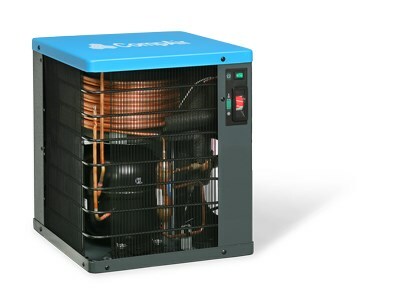 Compressor supplier CompAir Australasia has announced the launch of the FX series range of energy efficient refrigerant compressed air dryers. With flow capacities from 0.5 to 90.10 m3/min, CompAir claims the new range can satisfy the requirements for clean and dry compressed air for a wide variety of applications and industry sectors. 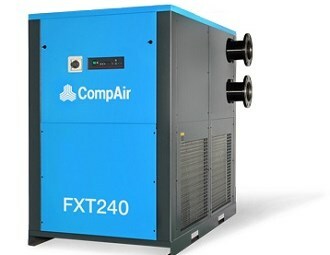 According to CompAir, air treatment is a prerequisite wherever clean and dry compressed air is required and that it is a necessity for critical applications such as those found in the medical, pharmaceutical, food and beverage sectors. The company adds it is also very important for any application that relies on compressed air as part of the production process. Compressed air is saturated with water as well as other atmospheric contaminants in addition to dirt and oil. CompAir says untreated compressed air not only adversely affects the end product being manufactured, but it also jeopardises the integrity of associated components, equipment and processes. CompAir has developed the FX series range of refrigerant compressed air dryers to effectively meet the requirements for dry compressed air. 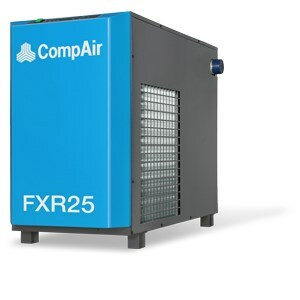 According to CompAir, the FX compressor range allows for efficient and environmentally friendly removal of moisture, oil, and moisture borne contaminants from compressed air. For flow capacities up to 1.6 m3/min, the FXS series models are ideal. CompAir claims the models produce pure, clean and dry compressed air from a simple, yet robust and sophisticated refrigerant dryer design. CompAir adds that the excellent dew point performance of the FXS series produces high quality compressed air. These models are ideal for point of use applications such as in hospitals and laboratories as they are both quiet in operation and have a small footprint. A static condenser and waste heat recovery system further ensures an energy efficient solution with the lowest operating costs. The larger FXR series models, for flow capacities starting at 2.5 m3/min, utilise an advanced stainless steel plate heat exchanger as well as advanced separation and refrigeration technology for optimum life cycle costs as well as dependable and energy efficient operation. The largest models in the range, the FXT series comes with a System Control Monitor II LED display. The display provides key information such as chiller inlet and discharge refrigerant temperatures , and optimises energy usage by intuitively adapting to system needs. CompAir says the new FX air dryer series are easy to install and simple to connect. Flow capacity ranges from 0.5-90.10 m3/min. R-134a or R-407c environmentally friendly refrigerant is used in all of the FX series models. 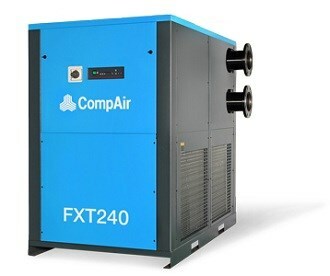 To accompany the launch of the FX series refrigerant compressed air dryers, CompAir has launched a new iPad App which allows the user to calculate the size of refrigerant compressed air dryer they require and gives users more information on the new FX series compressed air dryer range. Alternatively, you can find out more about the FX air dryer range on CompAir's website.